It was on December 3, 2006, in Glen Fork, West Virginia, that I preached the message, After Two Days We Lift Up The Voice Together, out of the Book of Hosea, Chapter 6. It is well known that God sent a prophet messenger, William Branham, to close out the seventh church age. Then He raised up an apostle, Raymond Jackson, and gave him a revelation revealing what would happen in Israel concerning the ending of the two days (two thousand years), when they are finished and beyond; showing how God restores back all their land and then gives them the gospel through two prophets as Israel recognizes and accepts the real Lamb of God as Jesus Christ their King. This is speaking of the elect of Israel. There began to be an awakening. The last church age was coming to an end and darkness was settling in the church world, but the promise of God in Zechariah 14:6-7 says, "Now before the day ends, the sun is going to break through." There's going to be some light, enough light to run back to the Word! And he says, "There shall be light at the evening time." Praise God, there was enough light to get us started in the right direction. There was enough light to get us out of organized religion. There was enough light to let us see there was one God, and enough light to show us water baptism in the name of Jesus Christ. He said He would give us light, and at the evening time there would be light. We've come through this evening light period. Just as the evening light in the natural does - the sun went down and darkness came upon the earth, but behold the Son arose in our hearts! There's a scripture in 2 Peter 1:19 that talks about the Word of God, it says, "We have also a more sure word of prophecy; whereunto ye do well that ye take heed, as unto a light that shineth in a dark place, until the day dawn, and the day star arise in your hearts." We have a more sure word of prophecy, which is the Bible, and we do well to look to the Bible. It will be a flashlight. It will keep us in line. It's not going to be like the sun, but it will be like a light shining in the darkness. It says, "You have that until the day dawns." Now the day is to dawn in the last day. It's the beginning of that third day. We've come through the two days, and after two days, notice that, after two days He will revive us and in the third day we shall live in His sight. Revelation 10:8-11 puts the wife in the third day. Two days have already passed and gone. The time cycle has elapsed and that's the finishing of the two days of Hosea 6:1-2, for the wife. 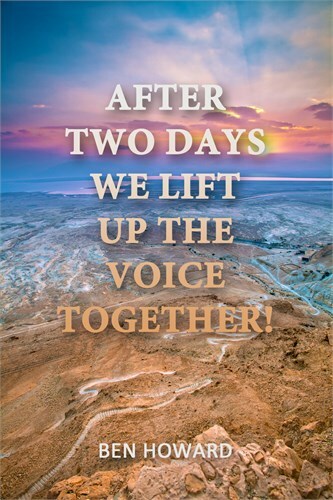 As we have come into the third day, Israel is going to take back every bit of her land. She's going to build that temple back and her King is going to come. The two Jewish prophets are going to come to that land and prophesy. There's going to be light in Israel. The sun is going to rise for her! But for the bride of Jesus Christ, He's standing here spiritually in the earth for her. "The sun of righteousness shall rise with healing in his wings." (Malachi 4:2) "After two days, He will revive us." The two days are up. We've had our time of wandering in the wilderness, but behold, let me announce to you today - that two days are over! Those two days have expired, they are completed! He said that just after this, He would heal. Jesus Christ, the same yesterday, today, and forever! After two days it shall be, and praise God, there's a healing balm in Gilead. There's healing for the bride, there's deliverance for the bride, there's a gospel for the bride, there's leadership and a ministry for the bride, and there's gifts for the bride of Jesus Christ! In Revelation 10:8, it says, "The voice from heaven spake again." The first time the voice spoke it put us through the church ages, and it was in that evening time that the mystery would be finished. (Revelation10:7) In the evening time the sun would come out in the form of seven spiritual angels making up the face of Christ, seven thunders uttering right out close together. In Hosea 6:2, it says, "After two days," so it's got to be after the year 2000. It has been the evening light, and during this evening light, Brother Raymond Jackson came and told us where Israel fit. He did this by revealing the second part to the fifth seal. Brother William Branham made known the first part of the fifth seal, but God through Brother Jackson revealed the second part of the fifth seal showing the trumpets, the vials, the 70th Week of Daniel, etc. So Brother Jackson was ministering in that evening light time period, and he thoroughly told us all about the brethren. (Note: The Lord took His servant Brother Jackson home as the two days were ending.) So God used Brother Jackson, a Gentile apostle to reveal God's workings with Israel so that our understanding would be complete here at rapturing time. Now after two days, we've got to realize where we are at. Let's come out of the evening light and walk in the light of a new day. The Son has risen, the two days are over, and we're in the third day. He has some watchmen here, Isaiah 52:7-8 says, "Thy watchmen shall lift up the the voice;" (The voice; not thy watchmen shall lift up their voices. They're lifting up the voice .) "With the voice together shall they sing: for they shall see eye to eye, when the Lord shall bring again Zion." Now when will it be? After two days, not in the church ages, that's now history. "The watchmen shall lift the voice; with the voice together." Now, it has to be together. He said, "They'll lift up the voice together," there is no difference. "Thy watchmen shall lift up the voice; with the voice together shall they sing: for they shall see eye to eye, when the Lord shall bring again Zion." You can look at Israel and see what is taking place; they are back in the homeland. He's bringing back Zion (natural and spiritual) after two days, and the two days have just elapsed and in that third day He will restore it. For further understanding, please listen to the audio, view the video, or read the 2006 and 2013 books below.